If you've eyes or ears, you'll have realised that Chris Isaak has been in the UK recently, presenting his dimpled chin, boyish charm and velvety aural offerings on just about every media outlet available. His ubiquity is thanks to the energetic promotion of his latest album, 'Beyond the Sun', a collection of covers from some of the great artists who have recorded at the legendary Sun Studios in Memphis, where the record itself was made. 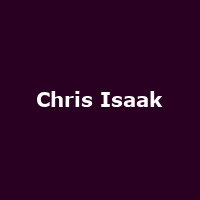 'Beyond the Sun' hit the UK album charts at an impressive No 6, Isaak's highest chart position since his 1991 breakthrough record 'Wicked Game'. If 'Wicked Game' was a collection of bluesy noire pop, 'Beyond the Sun' hints even more heavily at Isaak's influences in American country and traditional rhythm and blues. The record boasts plenty of classic hits from the Sun cannon, including Isaak's versions of Johnny Cash's 'Ring of Fire', Jerry Lee Lewis's 'Great Balls of Fire' and Elvis's 'It's Now or Never', among many more. Following the new record and the singer's sterling efforts to promote it, comes the UK tour which kicks off at the Bridgewater Hall in Manchester on Thursday 4th October. Isaak then drops into Glasgow, Wolverhampton and Bristol, before the final gig at the Hammersmith Apollo in London on Tuesday 9th October 2012. We will have tickets available when they go on sale at 9am on Friday 9th March, priced £35 for London and from £25 for all other dates. Given Chris Isaak's enduring popularity and, no doubt, a few new fans from the recent charm offensive, sales are expected to be brisk.